As the pundits and political odds makers calculate which Senate seats the GOP will likely recapture to achieve a majority, Ed Gillespie, the establishment Republican selected candidate for Senate in Virginia is not to be found on any of the “likely GOP pick-up” lists. Real Clear Politics and all the public polling show Virginia to be a safe Democratic hold. Indeed, Gillespie’s numbers have barely changed throughout the entire campaign, with the Republican nominee firmly mired in a deficit of somewhere between 12 and 25 points (the RCP average shows Democrat Mark Warner to be +20). Incumbent Democratic Senator Mark Warner voted for a large portion of President Obama’s unpopular agenda in the 111th Congress, and was especially vocal in his support for S 744, the hated Gang of Eight Senate immigration bill. Warner went out of his way to praise the bill’s amnesty for 11 million (or more likely a lot more) illegal aliens and its provision allowing more visas for temporary guest workers and high-tech workers – an inexplicable position given the number of unemployed and underemployed workers in the Virginia tech industry. Warner is also a supporter of Democrat-sponsored legislation to raise the minimum wage and stymie the approval of the Keystone XL pipeline. He also is a firm supporter of Obamacare and has opposed every bill or amendment to improve it or repeal it, including we might add efforts to protect the religious freedom of those who object to its abortion mandate (the Hobby Lobby amendment). Senator Warner has done nothing to protect the workers in Virginia coal country from the depredations of the EPA, and while talking a good game on protecting Virginia’s military bases and defense industry, he voted against selling F-16 fighters to Taiwan. These and many other votes would make fertile issues for an aggressive campaign against Warner by a conservative Republican challenger who wished to position himself as the conservative alternative to Mark Warner’s “me-too” embrace of Barack Obama. The problem is, Ed Gillespie is no conservative, and he certainly has not exhibited any tendencies toward running an aggressive campaign, or much of any campaign at all. But that should really not surprise any observer of Virginia or national politics. Gillespie is not a social conservative political activist or an economic conservative businessman – he is a longtime U.S. Chamber of Commerce establishment Republican professional political operative, strongly steeped in the Karl Rove ways of the GOP establishment and its strategy of running content-free campaigns. As such, he has no real commitment to the issues and shared values that would typically motivate conservatives to support him and vote for him – and certainly no interest in starting any fireworks with Warner over the incumbent’s support for amnesty for illegal aliens or engaging him in a fight over his vote against barring the EPA from regulating greenhouse gases that might have protected the jobs of Virginia coal miners. Ed Gillespie is no Eisenhower, and conservatives are long past any hope that he will ever bother to start campaigning for the Senate, let alone come out swinging, even when offered such a target-rich environment as Democrat Mark Warner’s record of embracing the agenda that currently has Barack Obama sitting at only 38 percent approval in the polls. 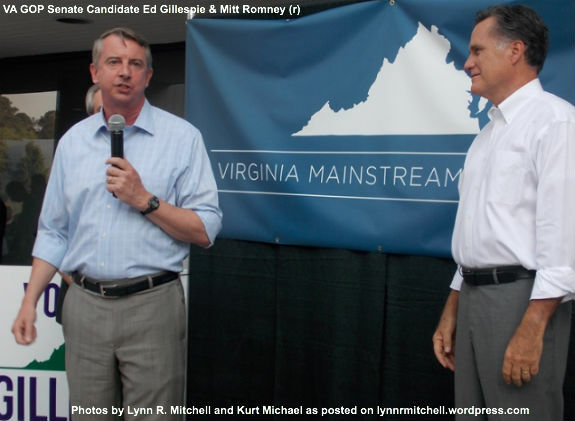 Some Gillespie apologists claim that he is planning to run for Governor of Virginia in 2017 and is merely using a “first do no harm” strategy in the Senate race to build his name identification and credibility for that run. If that is the case, then running a content-free campaign for Senate that has failed to make any case for him as an alternative to Mark Warner certainly disqualifies him from being the Republican standard-bearer in a race that will be the marquee off-year election of 2017. Submitted by Karen Wainio on Sat, 09/13/2014 - 14:33. Content free and brain dead. A committed, articulate Conservative could have defeated Warner this year. The amnesty issue alone could have done it, just as that issue was the most significant in defeating Eric Cantor this past June. But thanks to the Establishment hacks in the RPV who work on behalf of the National Chamber of Commerce this race is not even competitive. Its not that the Establishment doesn't get it. They do. The truth is they'd prefer an open-borders, Chamber friendly Mark Warner over any authentic Conservative.